2. In Europe the people dedicate an altar to him, also known as “St. Joseph’s Table” or “la tavola di San Giuseppe.” People decorate it with flowers, candles, wine and “lucky” foods..
3. According to the Catholic Encyclopedia, the Apocryphal Date for Joseph's birth is 90 BC in Bethlehem and the Apocryphal Date of his death is July 20, AD 18 in Nazareth. 4. The Church celebrates two feast days uniquely for Saint Joseph: March 19 for Joseph the Husband of Mary and May 1 for Joseph the Worker. 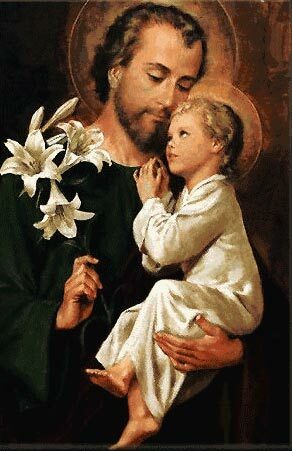 In 1955 Pope Pius XII established the Feast of "St. Joseph the Worker" . This is also May Day (International Workers' Day) since he is the patron of workers. 7. He is the patron of the Universal Church, a happy death, families, unborn, fathers, expectant mothers, travelers, immigrants, craftsmen, engineers, and workers. He’s also the patron of the Sicily, Americas, Canada, China, Croatia, Mexico, Korea, Austria, Belgium, Peru, the Philippines and Vietnam. 8. Josephology sub-disciplines of theology, in the 20th century did some people start to gather the Church’s insights about him. In the 1950s, three centers dedicated to the study of St. Joseph. 9. It’s tradition to wear red on St. Joseph’s Day. 10. He is mentioned in the Canon of the Mass.